This year's 17th meeting of performance artists IMAF has been marked by large migrant or refugee crisis. It does not matter how one names people running away from war, persecution, torture and poverty. Problem of migrant's invasion falls upon this region firstly, Serbia and neighboring countries, province of Vojvodina at north. Some of the neighboring countries are deciding to close their borders temporarily, build walls thus preventing refugees enter their territory. Thanks to these non-human measures and bordering problems arising from them, a certain number of invited artist was unable to come and participate on this IMAF. Each year, from the founding of IMAF, had it's specific situations, event in our surroundings, problems that bother the organizer and the participants alike. Things and moments ranging from most common financial problems, unstable political situations in the country up to this refugee crisis. Manifestation succeeds to overcome many new problems and, from all those more or less bad situations, to absorb the very best for the past 17 years. This year's festival was attended by 13 artists from France, Hungary and Serbia. 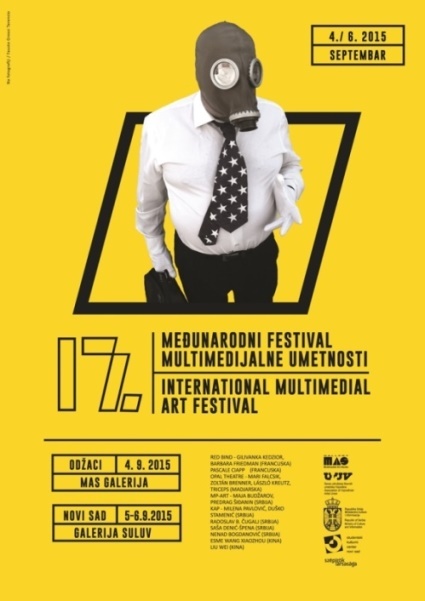 IMAF 2015 was held on September 4th at MAS Gallery (Multimedial Art Studio) in Odzaci and on September 5th and 6th at SULUV Gallery (Association of Vojvodinian Artist Union) in Novi Sad. Opening word at the festival was given by Gilivanka Kedzior and Barbara Friedman, our dear guests from France. They pointed out great importance of survival and continuity of the festival and their great pleasure of participation for the second time. 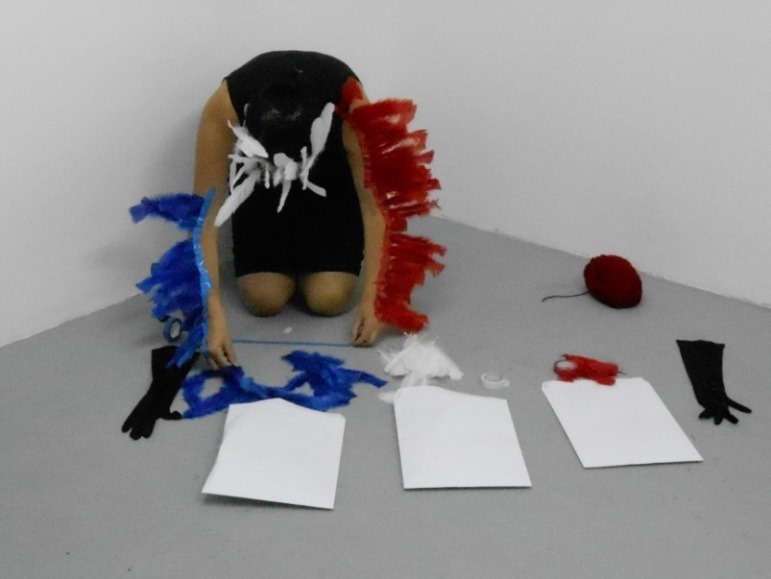 In the first performance in Odzaci titled „Blue, white, red #2“ Pascale Ciapp „flies“ out of the gallery like a bird, with her feathers colored like the flag of France. While leaving the red thread behind her she completes her performance in the street, under the heavy rain, immersing her body in large pile of manure. In Novi Sad Pascale presents herself with performance „The way of cross“ where she saws a thread in the sign of cross on her fingertips, using them to print on a pre-made form, for herself and audience present. Pascale touches the immigrants crisis with this performance but a certain number of works with this theme has spontaneously been realized by several authors during the festival. 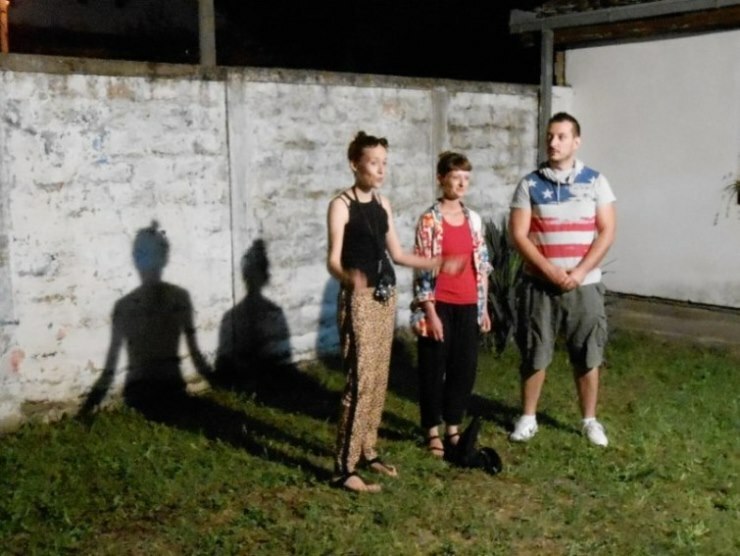 Art couple KAP (Milena Pavlovic and Dusko Stamenic) made two performances, one in Odzaci and one in Novi Sad titled „Secure area“. In KAP's safe space you find yourself surrounded by fences and wires but there is obviously no room for refugees. Inside „secure area“ communication and roads are closed, sadly not just for refugees but, by domino effect, those restrictions and difficulties shall be felt by citizens of many countries. Nenad Bogdanović is one author that directly dedicated his work to the refugees by his performance „Touches 2015“. Nenad invited all present people to touch and mark with their hands a map of Syria on the gallery wall, country from where all the refugees come. Then on this same space he played videos recorded on various border crossings, where one can see mistreating of the childrens, womens and people that are the refugees. On the very end, he wrote a question mark with his own blood. MP_art (Maja Budzarov and Predrag Sidjanin) made an interactive performance in Odzaci and Novi Sad titled „Concentration on Marina“. Authors distributed pre-printed postcard with Marina's portrait on one side and instructions on the other, inviting the audience to relax, focus and direct their thoughts to Marina. This „performance by act“ can be experienced like Marina's „Artist is present“ from MoMA in New York. Art couple RED BIND (Gilivanka Kedzior and Barbara Friedman) in their performance „Knacker’s ball“ dance with the music played by a local guitarist with their heads and eyes covered. Their relationship is connection, for us physical bind of red tape connected to the necklaces, real, surreal, questioned, explored in impossible situations... In the dance with all of us. Dance with the invisible, with silhouettes, leading the dance and wishing for freedom but always finding an obstacle for their connection. In Novi Sad, in their performance „Double bind #5: Dushan's paradise“ Gil and Barbara connect themselves with duct tape at the waist and, thus connected, they sit at the table set up with the dining dishes. Two of them, in their action as the two-headed god Shiva with many hands bring out of nowhere two bottles of beer binding them to their hands. The remaining hands place a tomato on a plate, and a Serbian word for tomato is pronounced the same as English word „paradise“. They cut it with a knife and paradise disappears in the mouth of one of the god's heads. Radoslav B. Chugaly in his performance „Stock broker“ changes, by trying them on his neck, a large number of ties. They are nice, colorful, fit him well on his selected suit, but none of them is good enough. He throws all of them on the floor after trying them, because they all choke him, tightening around his neck. They are like the noose for him, reminding him on a job that he is forced to perform and that doesn't satisfies him. Radoslav takes vengeance on a tie, as a symbol of a successful businessman, gather them together and nails them on a board for further exhibition. 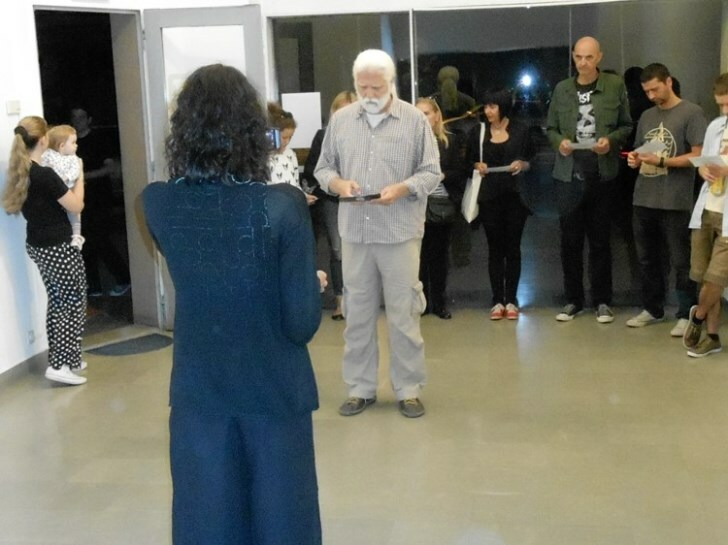 László Lantos, artist better known as Triceps has directed the first performance of the theatrical group OPAL, titled „Broken mirrors“, performed at MAS Gallery in Odzaci. László calls this work „songs for performers“. Poems of a well known Hungarian poet from Budapest, Mari Falcsik have been red. Poems were red on Serbian, Hungarian and English language by Mari and Zoltán Brenner supported by drums played by László Kreutz. 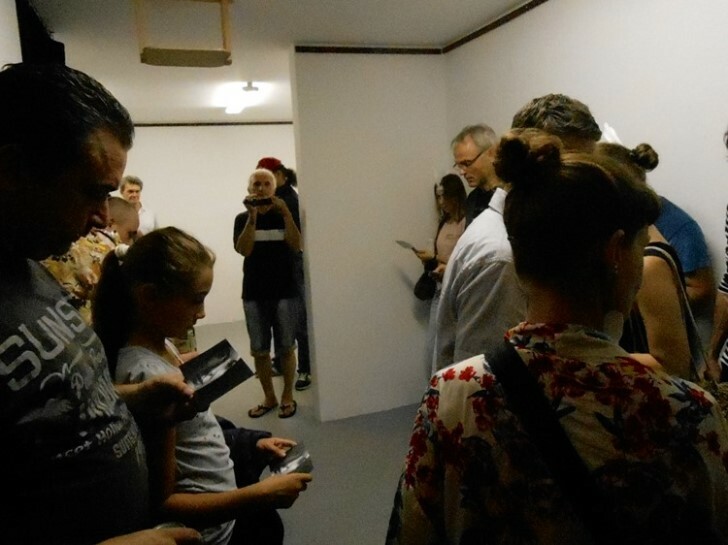 Besides the performance OPAL has, at SULUV Gallery, made a presentation of the film „DADA Univerzoom“, as an homage to early departed artist from Novi Sad Bada Dada. 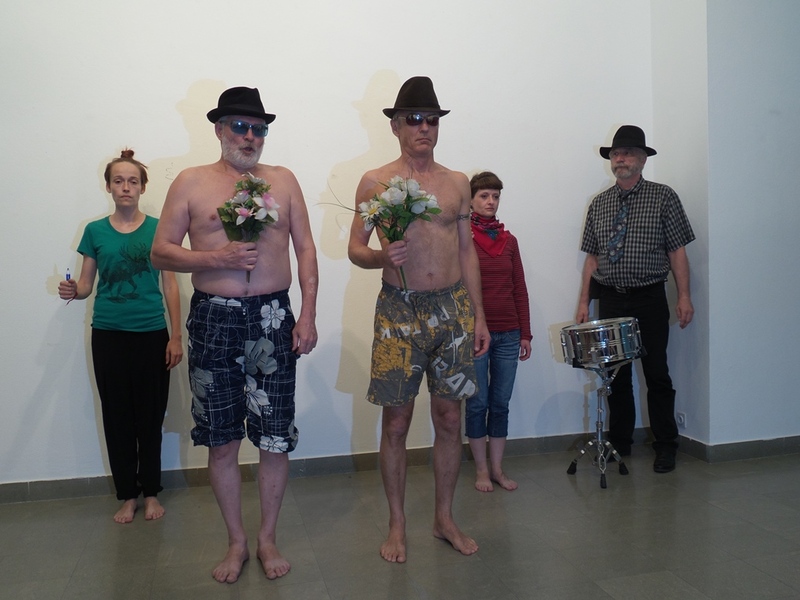 In the theatre performance of OPAL in Novi Sad Triceps and Zoltán Brenner stood half naked smelling „Warhol's flowers“. They red form the boards hung on the walls, on Serbian, Hungarian and English, verses written by Slavko Matkovic. A special note to this smelling of the flowers was given by percussions of László Kreutz. During their smelling of the flowers actors looked more and more like „flower children“ thanks to the drawings of art couple Gil and Barbara. OPAL Theatre „had“ to finish the show because, as Slavko says in his poem, smelling of the Warhol's flowers is limited by the duration of the smell on a reproduction. Ovogodišnji sedamnaesti susret umetnika performansa festivala IMAF obeležen je ovogodišnjom velikom imigrantskom iliti izbegličkom krizom. Nebitno ko kako sve naziva ljude koji beže od ratova, progona, mučenja i siromaštva. Problem invazije imigranata pogađa prvenstveno ovaj region, Srbije i susednih zemalja sa kojima se Srbija graniči, na severu pokrajine Vojvodine. Neke od susednih zemalja odlučuju da privremeno zatvore svoje granice, postave zidove i na taj način spreče ulazak izbeglica na svoju teritoriju. Zahvaljujući ovim nimalo humanim merama i prekograničnih problema koji su nastali, jedan broj pozvanih umetnika nije mogao da dođe, i učestvuje na ovogodišnjem IMAF festivalu. Svaka godina, od samog osnivanja festivala IMAF, ima svoje specifične situacije, događaje u okruženju, probleme sa kojima se organizator i sami učesnici susreću. To su stvari i momenti u rasponu od najčešćih finansijskih problema, nestabilnih političkih perioda u zemlji do ovogodšnje krize sa imigrantima. Manifestacija uspeva u savladavanju mnogih novonastalih problema i, iz svih tih manje više loših situacija, uspeva da apsorbuje ono najbolje, i tako već sedamnaestu godinu zaredom. Na ovogodišnjem 17. Međunarodnom festivalu multimedijalne umetnosti učestvovalo je trinaestoro umetnika iz Francuske, Mađarske i Srbije. IMAF 2015. je održan 4. Septembra u galeriji MAS (Studio za multimedijalnu umetnost) u Odžacima i 5. i 6. septembra u galeriji SULUV (Savez udruženja likovnih umetnika Vojvodine) u Novom Sadu. Pozdravnu reč na otvaranju festivala su imale Gilivanka Kedzior i Barbara Friedman naše drage gošće iz Francuske. One su istakle veoma veliki značaj opstanka i kontinuitet održavanja festivala i izuzetno zadovoljstvo ponovnog dolaska i učešća na festivalu po drugi put. U prvom odžačkom performansu pod nazivom „Plavo, belo, crveno #2“ Pascale Ciapp „poleće“ iz galerije kao ptica, sa perjem u bojama zastave Francuske. Ostavljajući za sobom crvenu nit završava performans na ulici, po velikom pljusku, uronivši telo u gomilu stajskog đubreta. U Novom Sadu Pascale se predstavlja performansom „Put krsta“ gde na prstima ruke ušiva iglom i koncem znak krsta, kojima kasnije pravi otiske za formular koji je ranije pripremila, kako za sebe tako i za sve prisutne. Pascale se ovim performansom dotiče imigrantske krize ali, na festivalu je spontano došlo do realizacije jednog broja radova na ovu temu, od strane više autora. Umetnički par KAP (Milena Pavlović i Duško Stamenić) su autori dva performansa, izvedenih u Odžacima i Novom Sadu, koji nose naziv „Siguran prostor“. U KAP-ovom sigurnom prostoru si opasan ogradama i žicom ali tu očigledno nema mesta za izbeglice. U „sigurnom prostoru“ komunikacija i putevi su nažalost zatvoreni ne samo za izbeglice nego, aktivacijom domino efekta, ta ograničenja i poteškoće će osetiti i svi ostali stanovnici raznih zemalja. Nenad Bogdanović je autor koji je direktno posvetio svoj rad izbegličkoj krizi performansom „Dodiri 2015.“ Nenad je pozvao prisutne da dodirnu i obeleže šakama mapu Sirije na zidu galerije, zemlje iz koje je i krenuo ovaj izbeglički talas. Zatim na istom prostoru pušta video dokumentaciju, zabeleženu na raznim graničnim prelazima, na kojima se može videti maltretiranje dece, žena i ostalih ljudi koji su sastavni deo izbegličke populacije. Na kraju, na mapi, svojom krvlju ispisuje znak pitanja. MP_art (Maja Budžarov i Predrag Šiđanin) u Odžacima i Novom Sadu izvode interaktivni performans pod nazivom „Koncentracija na Marinu“. Autori dele predhodno odštampanu razglednicu na kojoj je sa jedne strane portret Marine Abramović a na drugoj instrukcija, kojom pozivaju publiku da se opusti, koncentriše i usmere svoje misli na Marinu. Ovaj „performans samim činom“ može se doživeti i kao nastavak Marininog „Umetnik je prisutan“ iz Muzeju moderne umetnosti u Njujorku. Umetnički par RED BIND (Gilivanka Kedzior i Barbara Friedman) u performansu „Knacker’s ball“ igraju, uz zvuke balada lokalnog gitariste, pokrivenih glava i očiju. Njihov odnos je povezanost, za nas fizički crvenom trakom povezanu ogrlicama na vratovima, realna, nadrealna, koja se ispituje, istražuje u nemogućim situacijama... u igri sa svima nama. Igra sa nevidljivima, sa siluetama, koje vode igru i žele slobodu ali uvek nailaze na prepreku njihove povezanosti. U novosadskom performansu „Double Bind #5: Dušanov raj“ Gil i Barbara se povezuju lepljivom trakom u struku te tako „slepljene“ sedaju za sto na kojem je postavljen tanjir sa priborom za ručavanje. Njih dve u svojim akcijama, kao „dvoglavi“ bog Šiva sa mnogo ruku, niotkuda iznose na sto dve flaše piva koje vezuju za dve šake. Preostale slobodne ruke postavljaju na tanjir paradajz, čiji srpski izgovor na Engleskom jeziku znači raj, Seku ga nožem i raj nestaje u ustima jedne od „božijih“ glava. Radoslav B. Čugalj u performansu „Berzanski mešetar“ menja, probajući na sopstvenom vratu, veliki broj kravata. One su lepe, šarene, dobro mu stoje uz odabrano odelo, ali ni jedna mu ne odgovara. On ih sve odreda posle probavanja baca na pod, jer sve do jedne ga guše, stežu oko vrata. One ga stežu kao omča oko vrata ili ga, moguće je, podsećaju na posao koji silom prilika obavlja i koji ga ne ispunjava na zadovoljavajući način. Radoslav se sveti kravati, kao simbolu uspešnog poslovnog čoveka, skuplja ih i ukucava ekserima u dasku i izlaže prisutnima na uvid. Laslo Lantoš (László Lantos) umetnik poznatiji pod pseudonimom Triceps režirao je prvi performans pozorišne grupe OPAL , pod nazivom „Razbijeno ogledalo“, izvedenog u Galeriji MAS u Odžacima. Laslo ovo delo naziva „pesmama za performere“. Čitane su pesme poznate mađarske pesnikinje Mari Falčik (Mari Falcsik) iz Budimpešte. Pesme na srpskom, mađarskom i engleskom jeziku su čitali Mari i Zoltan Brener (Zoltán Brenner) uz muzičku podršku bubnjara Lasla Krajca (László Kreutz). 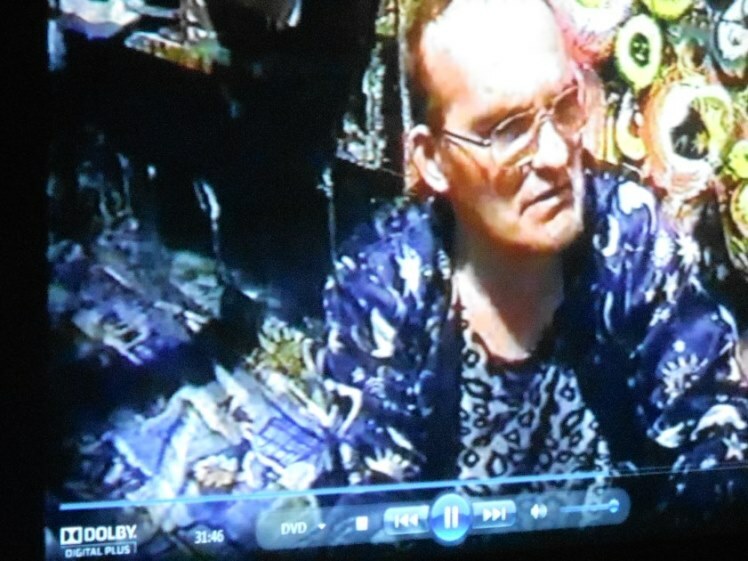 Pored performansa pozorište OPAL je, u galeriji SULUV, priredilo i prezentaciju filma „DADA univerzoom“, kao omaž novosadskom rano preminulom umetniku Badi Dadi. U performansu pozorišta OPAL u Novom Sadu Triceps i Laslo Brener su polugoli mirisali „Vorholovo cveće“. Oni su sa panoa, obešenih na zid galerije, čitali na srpskom, mađarskom i engleskom jeziku stihove Slavka Matkovića. Poseban šmek mirisanju „Vorholovog cveća“ su dale udaraljke u rukama bubnjara virtouza Lasla Krajca. Tokom njihovog mirisanja cveća akteri su sve više ličili na „decu cveća“ zahvaljujući crtačkom umeću umetničkog para Gil i Barbare. Pozorište OPAL je ipak „moralo“ da završi predstavu jer, kao što i Slavko u pesmi kaže, mirisanje Vorholovog cveća ograničeno je vremenom trajanja mirisa na reprodukciji. For several years, I explores the female body and feminine gender-singular-plural gender and Its relation to environments, to others, to Reviews another: body, mind and material, in perpetual interaction. I observed Evolution icts, icts limits, ict private / public borders, instability icts, icts folds, ict disturbances. I experiment are ways of thinking, and acts of oppression or unrecognized reconnu That May Affect it on what society tries to impose on the body in the connection of social, cultural, sexual, etc .. (de) demonstration and makes me wonder about a state of being white (verb / and common name) in society. So the topics of Concerns thinking I approach me in my daily life, my encounters, my activities, the news ... My projects are issues we reactions from observations That I confront, I turn, superimpose, cross, leave qui I get confused. My shares are kind of exoteric rites qui I defined as "agitations". Each action is a New Attempt in conjunction with a public, for a period, a situation, That I Appropriate space again. I experiment with every performance That I like to call "risky Action poetically" in qui I esthetics issue gains. I use art aussi Installation and video art as media. My art work Often appeal to the public through live gold Suggested involvement by favoring an unaware and popular public places, urban or rural. Very Involved in the development of contemporary art in alternative spaces I created in my town in 2006 Space o25rjj, art space "at home" for the Democratization of contemporary expression in qui I Regularly organizes Multidisciplinary events. MP_art is an acronym of the artistic couple [Maja Budzarov and Predrag Sidjanin] who regard their joint work as more important than collecting artistic biographies – ‘art consists of art alone, not artists’. Starting to live and work together in January 2003, they decided to reject their previously earned personal histories, the work under their own personal names as well as they reduced the mediums of their previous research. They focus on exploring mutual emotions and intimacy through a primarily physical (performance art) and meditative (painting/text/color) expression. In their work they equally use their bodies, photography, text, video, the Internet, and occasionally combinations of new media with different classical materials (paintings, ceramics and glass). Their works usually have a strong reference to the place, time and physical/meditative context in which a personal experience of intimacy and privacy reflects upon the universally recognized and accepted phenomena. Their artistic practice/strategy is based on closeness and directness, on interaction and liberation from ideological restraints imposed by mass communication, on the aesthetics of a personal attitude towards the world, post avant-garde and conceptual art experiences in the social context of the current moment, which they are openly critical of. Art couple KAP was founded in 2011 by Milena Pavlovic and Duško Stamenic. As a couple, we live our ideas and interests. Inspired by nature, man-woman relationship, personal emotions and impressions, we create. Our work mostly mirrors in movement research and performing arts, as well as photography, poetry and craftsmanship. A touch and a gaze as an answer to each other's questions: Who we Ar(e/t)? ​[ RED BIND ]. As visual artists working with performance, video, sound and photography, they analyze the confrontation to otherness and its inter-thematic with subjects such as : social yokes ; dominant/dominated relationships ; codes and what happens to them out of their context ; gender and its limits and ambiguities ; issues of the double and of the multiple characters under a single skin ; or yet the identity, status and image of Woman. They have shown video works at several international venues including the Mori+Stein Gallery (Jan. 2013) and the Prince Charles Cinema (Nov. 2011), in London, United Kingdom ; the CAM | Casoria Contemporary Art Museum in Naples, Italy (Mar. 2012) ; the MACA Junin | Museo de Arte Contemporaneo Argentino, in Buenos Aires, Argentina (June 2014) ; the University of la Rioja, Logrono, Spain (June 2012) ; the Faculty of Arts, Timisoara, Romania (Oct. 2012) ; the Cultural Center of Belgrade, Serbia (Oct. 2012) ; the Fundaçao Oriente, Macao, China (Dec. 2012) ; the SAZMANAB Plateform for Contemporary Arts, Teheran, Iran (Feb. 2013) ; Videotage, Hong Kong (Apr. 2013) ; the Museum of Contemporary Art of Wroclaw (Apr. 2013) and the Museum of Art of Lodz, Poland (June 2013). In the realm of performance, they have performed at events including the NUIT BLANCHE 2013 | 5th edition of FRASQ (Oct. 2013), Résurgences #5 (Oct. 2014) and Vision'R Festival (Nov. 2014), in Paris, France ; the 15th OPEN International Performance Art Festival and ART NOW Live Tour | International Performance Art Tour from Beijing to AnYang, in Beijing, China (Sept. 2014) ; IMAF 2013 | 15th International Multimedial Art Festival, in Serbia (Sept. 2013) ; ATHENS Video Art Festival | International Festival of Digital Arts & New Media, Athens, Greece (June 2013) ; MPA | Month of Performance Art, Berlin (May 2012) and ARENA... of the young Arts | International Theatre Festival, Erlangen, Germany (July 2012) ; the Lower Polk Art Walk and many Art galleries in San Francisco, United States (Nov. 2012). Their performance [ ACANTHESTHESIA ] has been rewarded with the ARENA... of the young Arts Co-Production Prize (July 2012, Erlangen, Germany). They currently live and work in Toulouse, France. The company was established in 1993 by Triceps (László Lantos), a performer and director from Subotica, Voivodina (now Serbia). For ten years, they worked and practised within the frames and facilities provided by Dharma Gate Buddhist College, Budapest, Hungary, searching for spiritual and coreographic traditions of the ancient East. In the last 22 years, they realized 50 performances with live music, physical theatre, ritual absurd, actionist and phonic performances, happenings, body art action, based on masterpieces by great authors as Platon, Shakespeare, Lautréamont, Huelsenbeck, Jarry, Ginsberg, Monty Cantsin, Bada Dada, Cage, The Residents, Laibach, Jodorowsky and others.